It’s so cool that I have a French relative, and I am learning so much from her. I was chatting with C the other day and asked her how she adapted so well to living in Singapore. I wanted her to tell me all about her Singapore culture shock. In response, she told me she should have written down the experiences from the first year she was here, because now she thinks she has become more Asian in her habits and has forgotten most of what appeared different at first. On the whole she and my cousin spot more similarities than differences. C sometimes feels she’s in a parallel universe when she compares her family in France to her in-laws in Singapore and my cousin does too. The similarities are what surprised them the most. C told me that she now likes the Asian custom of not wearing shoes in the house. She says that what they show on TV doesn’t actually happen in real life. No one ever really wears their shoes on their beds! Well at least not in France. C was shocked at how her husband (Ceylonese Singaporean) washed the bathroom. By wetting the whole area and scrubbing it clean. They don’t do it like that in France. You’re not supposed to get the floor soaking wet. Her mum would scold her for doing that. Rather they use a mop and the whole process is relatively dry. My take on this is that it has something to do with our weather. Perhaps in a humid climate where the floors are not made of wood (no danger of getting warped) or don’t get as cold, it’s ok to throughly wet and scrub them clean. Our mosaic, granite or ceramic tiled floors dry pretty fast – within 30 minutes or so. C loves Chinese food and told me she noticed our food is pretty oily. I have to agree. We tend not to notice it till we travel. Most of our cuisine is fried and starchy, but oh so good! She put on weight when she arrived but has since gone back to her healthy French habits and lost all the weight. No wonder French Girls are never fat! The cliché is true! Actually C was never really overweight. It was just that Singapore clothes come in a unreasonable size as most Singaporeans are skinny like twigs and underweight. Mostly because they are vain and hardly eat. Usually they only have soup. It’s a myth if you think that the girls are naturally thin. They are smaller frame or more fine boned though. At some places, xl clothes here are more like small or medium in terms of American size. C could only wear large or extra large and that made her feel conscious. But it was not a good measure as C is taller with a different frame. You could potentially develop an eating disorder here with the disheartening sizes at the malls. In France you are just French. Forms don’t ask you to state your race or ethnicity. It’s considered racist, in a way, by the French people. Everyone, as long as you’ve got citizenship, just states that they are French instead of Indian, Chinese or Malay as we do here. She was surprised that we don’t just put down Singaporean. I think that’s a great idea, and one that will make us all feel more connected. It would be cool that no matter what ethnic group or culture you belong to, you consider yourself Singaporean first. I think that would really help build a national identity. At the moment we have something like that, with our uniquely Singaporean food and our unique Singlish, that we can all identify with. One observation is that she is not lazy the way I am. She loves walking instead of taking a taxi. She walks pretty long distances too, undeterred by the hot sun. She told me that in France it’s pretty normal to walk long distances and she likes it. She loves our perpetual summer too! I am the total opposite and would rather take the escalator than the stairs. Also I’d rather hide in the air-conditioning than venture into the scorching sun. Perpetual summer – no thank you! I am always amused that she feels chilly in our air-conditioning and brings out her scarf to wrapped herself with. I asked her how she deals with snow where she’s from and she told me she just wears many layers. So I was wrong to assume that if you’re from a cold climate you can tolerate the cold better! We tend to eat soft refined bread while she loves hard chewy bread. She also misses her fresh raw salad at meals. I have been inspired, but I am too lazy to practice the walking habit. I am proud to say I have developed a taste for healthy salads with olive oil and balsamic vinegar dressing, and hard grainy breads. Since she came into our lives it’s been lovely. I am learning so much more, about myself too, and being more observant about food habits and culture. And she’s really a dear, putting up with all our cultural and family idiosyncracies. These days she just feels like one of us. Her colleagues tell her her English sounds like Singaporean English more than anything and that’s pretty funny too. I absolutely adore her and it’s great when we don’t notice ethnicity, because we’re all just human. I think it’ll take an alien invasion for human beings to realize that and stop with our ethnocentric ways. That’s why I love the blog world. Around here, there is no distinction – people you connect with just feel like another you, but perhaps living on another part of our little blue planet. 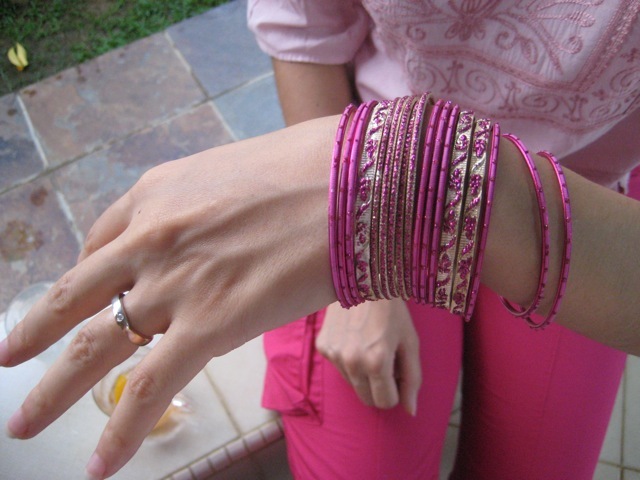 This entry was posted in Culture & Society and tagged bangles, blogging, ceylonese, culture, culture shock, ethnicity, expat, expatriate, family, French, French girl, Indian, interracial, Life, Living, people, personal, photography, pink bangles, relationships, Singapore, Singaporean, travel. Bookmark the permalink. I think if Singapore wants to encourage nationalism they should completely get rid of having to define oneself by their ethnicity. Its hard to feel part of a collective when you are constantly being divided into sub groups. yup I get annoyed with all the dividing. I feel we have more in common than differences. They eat very well but don’t really snack in between. They also savour their food spending at least an hour or so on meals. It’s pretty ritualistic 🙂 I should stop gobbling down my food! It’s a bad habit from the 1hour lunch that’s actually only 10 min because of the travel time that forces you to gobble and swallow your food down. Oh, and I absolutely LOVE those bracelets!!!! I’m originally from a small town an hour west of Boston. The city itself doesn’t get a ton of snow, but the suburbs and areas around those do. I often walked along sidewalks where the snow on either side of the shoveled path was several feet deep. In fact, Ravi and I are thoroughly amused by the idea of Snow World and play to go in January to amuse ourselves when our friends are up to their asses in snow. I don’t think that we’re less immune to cold, although my friends who have lived here longer often put on sweaters when we go into malls and I find them pleasantly cool. I joke that it’s because I’m from Boston…but we’ll have to see when we go back to Boston for a visit in November. I feel hot when I see people wearing sweaters at malls or even the skinny teens who layers their clothes in the hot streets of Singapore. I am always hot – I kinda radiate heat and that’s why I just love winter and cold climates. Boston was like magic to me because it was my very first experience with snow. It was actually freak weather in March and I saw it reported on CNN etc. For that reason and the best chocolate fudge brownie I have ever tasted, the best ever lobster bisque, plus my first time at the cheesecake factory, Boston will always have a place in my heart. How interesting! I love reading about other cultures. I found the size thing to be quite telling insight. If I lived there, I’m sure I’d have a complex too. Visiting from SITS congrats on your day! I love learning about different cultures. I never considered French food “healthy” until reading this. Guess I need to research that a little more. My cousin C walks loads too..she loves it. I am super lazy and I think Asian food is oily and not the good kind of oil. I enjoyed reading this post! In US, coming from different states, people have different eating habits, clothing choices, accents and the like. My dad was in the Army and one thing I love about travel were the food choices varying so much! I think our world is just fascinating and I want to keep exploring. Oh yes, forgot – visiting from SITS – congrats on your SITS day! I’ve been to Singapore and really enjoyed it. One of the odd cultural differences I noticed immediately was the way the drivers all abide by the speed limit – and they even have little bells in their cars (which are very clean!) that will ring if you exceed the speed limit. Pretty interesting. A friend of mine lived over there for 7 years – she LOVED it too. It’s a great place for expat living. I must get one of these bells. That’s so interesting. I think probably people are really afraid of getting caught by the police here because it’s not only a fine but demerit points as well. Too many demerit points and you get your license suspended. So cool to hear about the cultural differences. Thanks for sharing! What a fun study in culture … right in your own family! I just feel so lucky that C is in our lives 🙂 She is so much part of the family now. that is soo true…I think that all the time because my sister is always cold even in sunny Singapore. when i first arrived here in singapore, i was so shocked by how short the shorts girls were wearing! 🙂 they look so tiny! !